DAVID LE/Staff photo. 5/12/15. 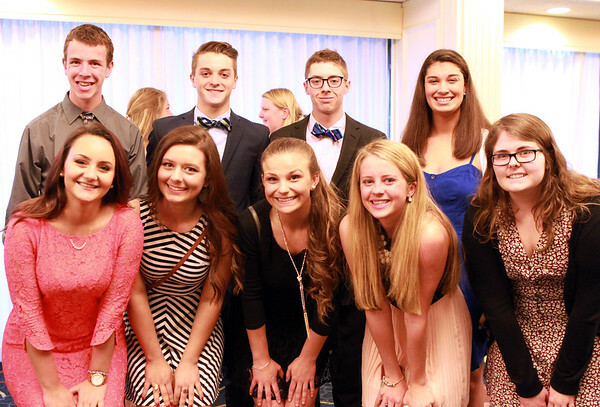 From left: Salem High School seniors Julia Jermyn, Sam Clyne, Sandy Pelkowsky, Kyle Doherty, Emily Lonergan, Cole Jermyn, Kendall Higgins, Rachael Zipper, and Alyssa Jackson, at the 47th annual Honor Scholors Recognition Dinner held at the DoubleTree in Danvers on Tuesday evening. Other Salem High School seniors receiving recognition were Anand Patel, Madison Ballou, Caroline LeBlanc, and Thuc Nguyen.